Popcorn Time is watching movies and TV shows illegally (for free) made extremely easy. In the Pirate Bay days of piracy, you had to search for what you were looking for in a process of trial-and-error. You had to hope a search yielded results, that at least one result still works, is of good quality and doesn’t infect your computing device with unwanted things. You had to know what you’re doing. Popcorn Time eliminates all that. While traditional pirating is a free-for-all, Popcorn Time is a curated, user friendly experience. The interface is Netflix-like: you select a title from an attractive array of posters. The selection is expansive, with all the major movies and TV shows. There is no trial-and-error as there’s only one file for each movie or TV show, and that file is there precisely for its high quality. Because the videos are streamed (peer-to-peer) and themselves curated, the main risk is whether the Popcorn Time app itself is malicious. I perused the developers’ blog and they seem like decent people. The permissions required to install the app seem reasonable. They even provide built-in VPN so you can use the app anonymously. But you never know. The app is also available for PC, Mac and Linux; an iOS version is apparently in the works though I can’t imagine how that would get Apple’s approval. 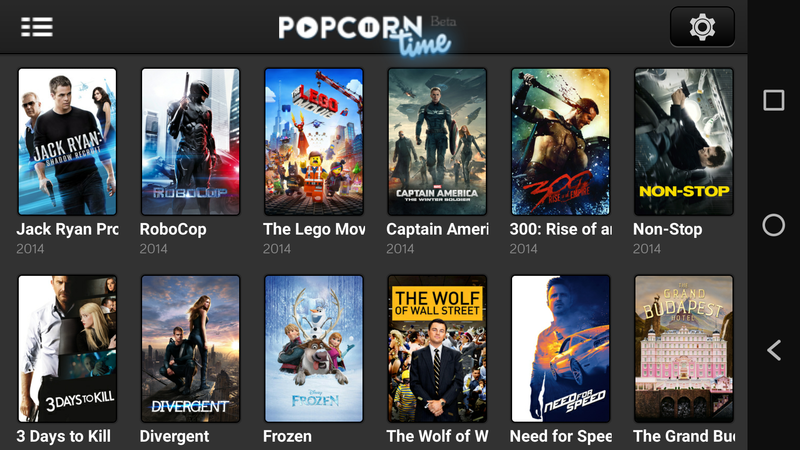 Popcorn Time is a game changer because most won’t go to the trouble of connecting their PC to their TV; now, with a simple dongle and an app, you can watch all the latest movies and TV shows from the comfort of your couch…free! It’s pirating made ridiculously easy – accessible enough for the masses. Does it work well? Popcorn Time crashes a lot on my OnePlus One. I’ve been able to stream TV episodes with no problems, but so far haven’t been able to get a movie to play (or lack the patience for the app to download enough for the stream to start). The quality is great: 720P in most cases, so file sizes are huge. Videos mostly play without lag or distortion on my 10 MB cable connection. It’s an amazing service; a killer app for the Chromecast and a glimpse of the future of television. It is of course also illegal. Nice blog – I just stumbled upon it via a link to your Xiaomi report on why it isn’t an ‘internet’ but rather a hardware company. Now as to Popcorn Time, as a word of caution, in Germany users of Popcorn Time have repeatedly been the target of cease and desist letters with penalties of EUR 800 as a minimum, lastest in January 2015. This may be specific to Germany and the German legal system. The argument is, however, that users of Popcorn Time are actively offering illegal content by redistributing it on the peer-to-peer network on which Popcorn Time builds. This is in contrast to streaming. I would, therefore, suggest not to use Popcorn Time or any other p2p-based services unless to access content that is strictly legal. i actually prefer the app ShowBox. It’s not the the Google Play store but it works brilliantly and the have a Ton of content.